How do you live vicariously through Lenn Thompson? (And why would you want to?) What are "wines of joy"? Is it time for an AOC system for New York wines? We think this is one of the most insightful posts yet in this series. If you're a consumer, this is dense but tremendously educational when it comes to how the wines you want end up in the stores you visit. If you're in the industry, there is wisdom here. Rick Rainey is the Director of Sales Education for Winebow, an American importer and distributor. He lives in Trumansburg near Cayuga Lake. Are New York wines being held back? I'm enjoying great success with Ravines Wine Cellars in all of our markets (DC, PA, NY, NJ, CT, MA and Chicago, Illinois). Of course, there are some markets that I believe are not realizing all of their potential, but I'm confident that will happen. So then the question becomes what are those producers doing well (Wiemer also comes to mind) that is not holding them back? As a distributor I'm interested in a partner that provides consistent and interesting wines with an expression of their region. In other words, what story is this wine telling me that would give me cause to buy it instead of a wine from some other region (this must be my French wine background shining through). I'm also interested in pricing that is competitive with the other wines of its category from around the world. There are piles of great wine out there and, while pricing is not the ultimate deciding factor, it is an obviously huge part of the equation. Also, I'm interested in an open partnership where we both have the same vision for the brand in the long term -- this is really helpful when it comes to making the tough decisions like, "How do we decide to allocate a recently highly-rated wine?" for instance. You have a business relationship with Ravines Wine Cellars, owned by the Hallgren family. How did you develop that relationship? How important is the personal connection, as opposed to the business side? Several years ago I had the chance to taste one of Morten's early rieslings. My honest opinion was that though I didn't necessarily think the wine was where it could be, I believe it showed that the winemaker knew where he was going...in a big way. I've spent a fair amount of time in France for work tasting wines from new producers and often you would taste a new winery and say, "Oh yes, he will be great but he just has a few more kinks to work out." If you ask me for another fairly recent example of this in the Finger Lakes I would say I felt that way a while back when I first tasted Billsboro Winery's wines. You know this happens with restaurants as well. It is not meant to be disrespectful but if your job is to find great producers for your sales reps to take out and present to their customers, you really do need to be brutally honest with yourself about the wines you're tasting. It is really hard to say to a customer, "I know this wine isn't stunning today, but just wait until two years from now when he really reaches his stride." From Day one we need to be in the game -- maybe not brilliance, but at least in the game. How did I develop my relationship with the Hallgren family? Funny story, as it took me about two or three years to convince them to come with Winebow. No joke, we had long, long conversations about working together but the stars just never aligned. Ultimately it was for the best because during that time we all learned a few more things, so when it finally did happen we were all on the same page. Remember, presenting a Finger Lakes wine producer to our New York City sales team was no walk in the park. Like most emerging regions, something Winebow has always been interested in (we really got our start in Southern Italy and continue today with wines from say, Greece), many sales reps thought we were simply out of our mind. It has required some real dedication and hard work by the Hallgrens and I have immense respect for them because of that. I also have a lot of respect for those sales reps that saw the potential for this producer and felt confident that they could compete on the world wine stage and took the time to show the wine to their customers. The Hallgrens are one of our hardest working suppliers. The personal connection just seems to always happen with small producers. Over the summer I had a producer from France in town and I invited Morten and Lisa over for dinner. We all just have so much in common because (this may seem hokey) we all live and die by the vine. My wife owns a retail store so there is a real bond that often overshadows the business aspect or at least lets it exist in harmony with the business aspect because we all understand the challenges from the vineyard to the store shelf. That being said, we all have huge challenges and ultimately we all have to provide for our families, so having the ability to be absolutely honest about business is a real plus. How do you determine whether you'll seek other business relationships with New York state producers? Currently we distribute The Grapes of Roth (LI), Millbrook Vineyards (Hudson Valley), Wolffer Estate (LI) and Ravines (FL) so we kind of have the category covered. We have never been the kind of company that went out and tried to "own" a category by having as many producers as possible from a particular region. This is one model that works for some distributors but with the kind of attention we try and give to all our suppliers, this would just be a difficult thing to do. Until we hit the production ceiling on a producer and they simply can't make any more wine and keep quality at the level we need, the conversation doesn't normally come up. 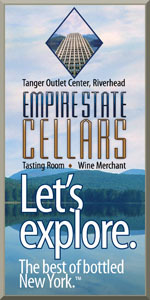 What is your opinion of New York wine produced outside the Finger Lakes? Unfortunately, other than the Long Island and Hudson Valley producers we distribute, I don't get much opportunity to try other producers. 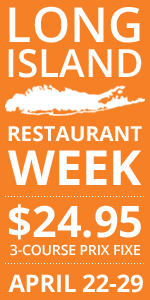 I wish I did get to taste more Long Island producers because I find it really interesting to see what they are up to... I suppose I have to live vicariously through Lenn! If you sell everything in your backyard, the market becomes saturated, the prices go down, and everyone eventually struggles. Fortunately we have good cellar door sales, which probably helps to lessen the pain of selling at lower margins, but if you continue to want to grow your brand, increase your production and decrease your production cost, then eventually you need to address the distribution question. Unfortunately, from the conversations I have had with some of my friends in the area who own wineries, many of them are not sure how to manage that relationship or even how to have it. Perhaps having these kind of conversations will give them a tiny bit of insight. I don't think I could speak for the Hudson Valley and Long Island producers. Seriously, it is a plane ride from the Finger Lakes to Long Island; it takes less time to go from Strasborg to Avignon. I would be speaking out of school on anything but the Finger Lakes... but if you're pressing for one theme, mine is the "diversity within our state", from one unique viticultural region to the other across our vast state (lush valley locations, ocean-influenced vineyards, deep lakes moderating otherwise frightening temperatures). I understand and appreciate the idea of all of us working together under the heading of "New York," but when it comes to wine, I can't help but want to celebrate them all independently for their own uniqueness. Respect in the wine business comes from regions (producers) that do the work that is required to overcome the roadblocks that prevent us from discovering what the true personality is of that place. I respect and appreciate any region that can give me a snapshot of that place (liquid geography) without me ever having to leave the comfort of my dining room. It is a huge question in regards to how we get there, but one of my suggestions, at least for the Finger Lakes, is to differentiate between what I call the "wines of joy," (we know the ones, the sweeter, less contemplative, "fun" wines that are drunk by the bucket-loads around the tasting rooms). It is crazy not to realize the importance of these types of wines, but I also believe they should have their own category that prevents them from bleeding over and vice versa into the "other" wines. I say "other" because not all the wines that would be considered the type that compete on the world wine stage are always vinifera, though for the most part they seem to be. It is imperative that we look at giving the consumer a guarantee of quality. If we can't come to a wide agreement, then I would like to see growers getting together, agreeing on some basic principles regarding what determines quality (that's a can of worms) and pushing each other to meet those standards and then coming together and telling the story of their work in a unified voice. The AOC system is by no means perfect, but I do think if we look back in history many of these regions have faced very similar challenges and we would be wise to try and learn from them... It would probably save us a whole bunch of time. No offense to Evan, but there is really no information in this interview of any substance. He doesnt even answer any of your questions. Seems like every answer is a "safe" one. He's a "wine educator" and he can't comment on NY wines outside of the Finger Lakes? But yet his company distributes long island wines? I dont get it. I think this was the wrong person to interview on these subjects. Wino - Love you man, but couldn't disagree more on this one. Rick's relationship with Ravines has created an extremely successful situation for one of the region's top producers, and the story of how that evolved is one I had never heard. And there's nothing safe about saying that the first time he tasted the wine from one of his own producers, he was not utterly blown away. Most of the time you'll get marketing speak - "One taste and it was love!" - but in this case you got the real story. I think there's tremendous value in that. The talk about AOC has intensified this year, and Rick's comments only add to a growing chorus on this issue. That's also interesting, whether you agree with him or not. The only answer Rick gave that might not have directly answered the question was the first, and you can blame his interlocutor for that, because the very premise was one he disagrees with. Evan- I did generalize a bit, sorry, but he did dance around answering more than one of your questions, and yes he evades the first one. You ask him about branding a grape for the finger lakes, and he evades the question and answers it diplomatically (which he did more than once). There is a clear answer to this question here. It is Riesling. The finger lakes is Riesling country. Yes, wineries are producing world class reds as well, but if this region is going to be recognized on a national or worldwide level it is going to be for Riesling not for cab franc of pinot noir. Wino - Absolutely agree with you there. (Though I've seen major strides with the other grapes you mention.) What are your thoughts on a potential AOC up here? The AOC is a no brainer. It has to happen. The organizations that are subsidized now are either unfocused, are funded by wineries (and not the good ones) and/or are outdated and are not doing much for the region outside or tourism. I'd have to agree with the Wino on this as well. It seems as much that the wrong people are speaking for the region. I appreciate the Cork Report for being an advocate of all things New York and it's with great nobility that you guys are involved but I think leadership needs to come from a few brave individual growers/winemakers that are ready to step up and claim all the things we seem to be talking about. There will always be a conflict of interest when it comes to rules and regulations and "AOC's"and the people who take the lead in writing them up but it would be nice if Merwerth, Higgins and Morten became the voice of the new FLX generation. I think at this point they've had success, great success and may just be afraid to shake the cage that is a conservative FLX culture. I appreciate Rick being a proponent of the region and in many respects Winebow should be congratulated for support (many distrubutors won't even take FLX on) but I think it's time we push the true creators and expressors of FLX terroir to own up. The Advocates need to push them to take the torch and not worry about 15 grape varietals and limo tours. Peter - I appreciate the feedback, but I'm confused about some of it. You wrote, "The wrong people are speaking for the region." That's attacking a huge straw man. Why do you think Rick is "speaking for the region"? That misses the point entirely. This series is designed to show what a variety of people within the wine industry think about NY wines, and why. Each person comes from a different background and perspective. None are claiming to speak for the region. In fact, Rick emphatically says he's not speaking for the region, but only his own experience. You also write that the top producers "may just be afraid to shake the cage that is a conservative FLX culture." I don't think it's fair to say that Johannes Reinhardt, or David Whiting, or Fred Merwarth, or Tom Higgins or Morten Hallgren or Bob Madill or Vinny Aliperti or Mark Veraguth... I don't think it's fair to say these folks are afraid of anything. The fact is, establishing a new quality system is a large undertaking, and these people are already extremely busy. That's not to say they shouldn't get involved, but I would never assume that anyone is "afraid" simply because they're not rattling cages on this issue. It's easy for someone to talk about it when asked; quite another to actively put together a plan and then seek to implement it. So the question becomes: Whose job should that be? Who has the time, energy, and inclination to take the lead? But I agree with you that the only way for it to happen is to have the outspoken support of the top producers. I hope that does transpire. We'll report more heavily on this subject, soon. I'd simply urge you not to conclude that anyone is afraid of speaking up - it's more likely that people are busy and have been unable to find time to solve a rather labyrinthine problem. From the questions I received above and certainly not the first one, I do not see where I received one about "branding a grape" I did receive "If New York wines can be branded with one idea or theme in mind" and I answered that by stating that the diversity within the state was the theme that came across for me. Indeed Riesling is wonderful (for Upstate) and obviously has been determined to be the "grape" of the Finger Lakes and currently getting the most press but I have some information for you to consider: YTD I have sold 34% Riesling and 11% Pinot Noir. Do not count Pinot out of the equation. In regards to being too diplomatic, well I'm sorry about that but I have learned one thing about this industry, the one I make my living in everyday and that is it is VERY small and being respectful to those that work hard everyday to provide for their families in a difficult business is my preferred method. I find it is a much better conversation and more productive to study the successful and talk about how to institute what they are practicing. Being critical just to be critical, I'll leave that to others. perspective to possibly help some smaller producers out there or consumers that wondered how this all happens - it was not my intent to spell all that is wrong with our industry. I apologize if I missed the point of the article. Wino - Evan stated my position as a Director of Sales Ed (much different from a Wine Educator - they educate about wine) but in addition to that, important for this article, is that I have spent the last 12 years working with producers and the wines of France - in our industry this is called a brand manager. I started with Morten, who grew up in the South of France, about 2 years ago. It is my role as a brand manager that puts me in contact on a daily basis with growers from Burgundy to the Rhone and now the Finger Lakes. We have an in-house expert on the wines of Long Island, so thankfully when I need assistance he is just a phone call away. Evan, it will be interesting to see who you interview for this series. I have to say that this interview, while informative, really did not get into the subjects the way I had hoped. The questions were there, but the answers weren't. Peter raises some good points, and you countered them equally as well. Like I had said earlier, the organizations that are acting as voice of the finger lakes and aren't doing much more than driving tourism, and promoting a chocolate and wine tour, etc. This is where Peter was going with this IMO. While these things are good for the region's economy, it does not raise the standard or help the region's quality at all. Individual producers are raising the bar, but like you said, they have a business to run, and can not even begin to think about teaming up with their neighbor to fight the good fight, let alone start revolutionizing the AVA/AOC system in America. If i want to find out about finger lakes producers, where do I go besides NYCR? Uncork New York? Finger Lakes Wine Country's website? There is nothing that is hard-core focused on bringing to light the real standouts of the region. You can not "lump" together finger lakes wines. There is just too much homogenized, non-vinifera, puppy dog wines out there catering to the masses. There needs to be a separation. The "AOC" would do this, but there isnt even an "AOC" for west coast wines. So the process of getting a mostly ignored region like the finger lakes to do this is a huge undertaking, but a very exciting one. The AVA system is an extremely poor regulatory system. So I think the system to be put in place in the Finger Lakes would almost be a grassroots type of deal, done by individual producers, and grown from there. I dont think one day someone will just roll out with a brand new government backed "AOC" system for only the finger lakes. Why can we not accept his answers for what they are? Diversity is a NY strength. Likewise diversity of thinking and diversity of opinion result in a better grasp of a situation. NY wine quality is no longer the issue that it was in the 80s and 90s. Of course more can be done and will be done. But like other wine regions the market is now stratified with a good handful of srong performers and larger amount in the middle and some who have opportunities to improve their product. That will always be the case. So what is lacking is an industry's will to mount anything ambitious to promote itself. There are no visible signs that this is about to change as there are no initiatives beyond the few who now and then come out with a new idea or a new twist on something that was tried before or elsewhere. - Does the consumer care? Most consumers do not know what AOC stands for. And if it is a device that will help in promotion then why not address promotion directly? Is AOC about building the self confidence of a wine region? - Is AOC largely inside baseball? - Will an AOC system automatically result in higher wine quality? - Why is it that in Europe there are pressures to get rid of AOC in may regions? Above all NY is lacking useful leadership and the industry is not exhibiting the will to change. What are your thoughts on Charles' points? He raises some important questions about a potential AOC, and I'd love to hear them addressed. Charles - I support an AOC, but I'll hold my further thoughts for now. Thanks for raising important and absolutely relevant questions about it. In a broad sense I think the AOC model is a good starting point because it simply serves as a goal or at the very least a fairly good reference. The goal in this case being the authenticity and some form of guarantee of quality of a region so that the consumer has some idea what to expect. Additionally, from a marketing perspective, the ability to speak with one voice instead of trying to "one at a time it" all the time would be really helpful to the vast majority of small producers that make up the NY wine world . Whether it is a chicken (Bresse), cheese (Brie) or even Beef (Charolais) I think it is helpful for consumers to have some idea what they are plunking down their money for and that we as producers are looking to guarantee a level of quality for right of that stamp, seal or AOC type designation. Are there issues with the AOC system and could it not be improved...oh yes. Are their crazy restrictions that make you want to scream...certainly! Can we use it as a framework to do what we need it to do...I believe so. This is conversation I think is hugely important as well and count me in helping to move it forward on-line or off. Charles - we (my wife Dewi and I) would like to plan a trip to come down (in the spring) and see our producers including NY's own potato vodka - LiV, would it be okay to reach out to you for some suggestions? It would be much appreciated. I have however an issue with the statement "Currently we distribute The Grapes of Roth (LI), Millbrook Vineyards (Hudson Valley), Wolffer Estate (LI) and Ravines (FL) so we kind of have the category covered." Do you really have the category covered? If so, why does Winebow have eighteen Greek wine producers and something like fifty California producers? Thirteen more from the Pacific NW? I can't count all the Italians, and there are ten producers from Austria alone. You need twelve Beaujolais producers? I love distributors, and believe in, and am focused squarely on distribution in managing my marketing. But my question is when will a distributor in NYS break with convention and choose to distribute thirty or forty NY producers in their own home state? At this rate, we'll need 100 more distributors to handle the number of NY wineries needing professional distribution. It's just my opinion, but any winery that makes more than the tasting room sells needs a distributor. Rick is spot-on with the diversity argument though. It's tough to pigeon hole a region into one or two or even three varieties, or styles. We are naturally diverse, and as such, any sort of pigeonholing would restrict further and potentially great developments down the road. Jim - I agree. Why a bunch of Greek and Hungarian wines, and not enough NY? But that's the fault of NY state wineries. No one elses. Greece and Hungary gave enough money and targeted marketing to their industry to appeal to the distributors and wine writers and can offer great discounts to liquor stores on wine sales at competitive prices. NY wine producers are simply not doing enough of the right things to attract attention to their own product. I won;t go on there, you know my thoughts. Charles - loved your response. RR - Great essay. Liked a lot of it. However, I am tired of hearing about the sweet wines from a lot of people. That's a bigus card. California makes more sweet white zinfandel than all of NY ever could. The cheap crap pink stuff doesn't seem to tarnish the glow of some of the better wineries in Napa and Sonoma. That's a red herring. I've had good wines and junk in eery region I've ever tasted. What liquor store owners need to do is stop shelving NY's better wines with the sweet reds and pinks, all next to one another. Put all the pink stuff from all over together somewhere in the store. Why is the NY pink stuff blended in with the better NY wines? No one is putting Beringer White Zin next to Neibaum-Copola and Opus One just because they come from the Napa Valley. That's one of NY's biggest problems. Jim - distribute 30 or 40 NY producers? This is a great sentiment, but if I were a distributor striving to showcase the best wines of a region I dont think I could find that many in NY. Even among the wine regions of france and Italy distributors have to sift through way more wineries in one region that NY has as a whole. Im sorry to say, but there are only a handful on wineries in NY making world class wines. If you were to distribute 40 NY wineries you would surely be diluting your portfolio. Could you walk into a wine shop to the NY section that carried 40 different wineries and find one wine from each of them that you would want to spend your hard earned dollar on? Wino, I'm not sure your name or background but you seem like you know what you're talking about. But let's not pretend everything in distribution is sifted through and vetted for quality. Quality has nothing to do with this. Red Cat isn't a quality icon but it's very popular, very well priced, and sells a ton. So does Winter White here on LI. It outsells the next 10 wineries by itself but I don't see it winning wine of the year prizes any time soon. "Diluting portfolios" and arguments about world-class this or that has nothing to do with the economics of the wine business and the engine that is "distribution." Distributors don't strive to showcase anything. They strive to build brands, sell wine, roll trucks, employ people, and make money at the end of the day. If I had to care for my family with my profits distributing Red Cat or with Gravner's Italians, I'll distribute Red Cat, and go home and drink Gravner. Carlo - Why so many Greek and otherwise obscure regions and not NY? That's easy. Distributors like to bet on being the first to the popularity party with a particular category. Winebow was and is a pioneering company is many of these categories, beginning with their stunning Italian portfolio and ever expanding since then. But you can see how NY is treated by distributors here. We are Greece; we are Cyprus. We are not the next California or even the next Austria. Not until we get ourselves on message. They look at us as an "exotic" category to sift through, cherry pick for quality and move on. And who can blame them? Even though quality is not necessarily a factor to sales and distribution in all cases, it is a factor we can sell, and it may be our best argument looking forward. I think perhaps I was not clear in my comments about "sweet" wines. My intent was to say that these wines are hugely important to the bottom line of many wineries and likewise growers but that they need to have their own category (silly name but "wines of joy" or some other appropriate designation) that would serve to get them their own market spotlight thereby not shadowing the wines most of us at this site like to drink. Notice I did not say just vinifera but as I mentioned before this does tend to be the case 99% of the time. The bleed over from the sweet category has been hugely detrimental to the perception of NY and we need to stop it but obviously not destroying the category while trying. One last point regarding retailers - most are just like the rest of us and want to put wines in their customers hands that makes them happy so they come back and buy more. As the perception of quality and value rises (which it is) and therefore potential retail sales so does the attention paid by retailers. I hope that clears up my earlier comments. Even if some were disappointed by the initial post, I think this follow-up discussion has great value -- just goes to show you why blogs have a distinct advantage over print. Immediate reader feedback and commentary. First, Wino is write about one thing for sure -- there are not 30-40 wineries that I'd want to distribute, not yet anyway. But to Jim's point, let's not kid ourselves into thinking that every wine in distribution is "world-class" (a term that gets bandied about too often). A visit to many of my local shops will prove that -- lots of junk from all over the world. Rick, I'm curious to hear how the NY stuff that you work with sells beyond Ravines (which you discussed already). The Ravines wines are typically very good QPR, but I'm wondering if you find that to be the case with the GoR, Millbrook and Wolffer. Jim- I may be mistaken, but we werent talking about the economics of the wine biz here. We were talking about ways to drive the quality of FLX wines to a higher level. Sure, everyone needs to have that 'moneymaker", but you do not need to compromise your beliefs to do it. I happen to work for a very successful company that has never compromised their philosophy for the almighty buck. You build your reputation by trying to bring the customer the best quality and value possible. That's like saying "well we picked up yellowtail because it sells like crazy, who cares if it tastes like grape juice kool aid and has no soul". Sure, in a perfect world, winebow would carry every single NY wine, but it just doesnt work like that, and it's OK. This is what sets apart a good distributor from a bad one. If you were a retailer would you rather buy from a distributor that puts care and thought into their portfolio? Or one that picks up wines regardless of quality just because they sell? And then puts you under the gun to sell 10,000- cases of it because they made 500,000 of them. That's what southern wines and spirits does. The lower end mass produced FLX wines, while good for the economy, are single-handedly dumbing down the face of NY wines. I am "Wino" and I have worked in the wine business for about 8 years now, from retail, to marketing and currently as a sales rep for an importor and distributor. I am a retailer (Rick's wife actually) and to go back to Charles' questions about the AOC-type system and its probability of success, my comment is that I believe it could be effective with customers and also, eventually in raising wine quality. In my small store, we absolutely could get its meaning across, so it would not be "inside baseball." It would take some time, "one-at-a-timing" it in fact, but that is what we do. And with effective labeling/special logo designatation, as well as the media informing the public (such a system would most definitely be newsworthy seeing as it doesn't exist anywhere else in the country). However, how can the government handle regulating this? It gives me a headache to even think how that would be sustainable with our current organizations and budget woes. I like the idea of an association of like-minded wineries who designate quality guidelines and strive to compete on the world scene. The French "Vigneron Independant" and the German "VDP" absolutely have meaning to me in my tasting experience. I know before I even put a sip up to my lips that viticultural care will be evident in the wine and the wine will likely express purity and character. If I do not know a producer yet I see the wine has one of those name/logos on the neck label, I am likely to go for it, and with quite a bit of confidence. A few years ago, there was a group called The Finger Lakes Wine Guild which included 6 or 8 producers (Weimer, Shalestone and Sheldrake were some I remember) and they had a website where they touted some general philosophies of quality and ensured the consumer that members' grapes were estate grown and vinifera. Now those are not necessarily the guidelines of quality (Ravines currently buys all of its grapes and we recognize it is a benchmark producer), but I liked the idea of this. Of course, I'd be much more interested in low yields and non-interventionist winemaking. The group is so thoroughly defunct that when I saw Bob Madill (of Sheldrake) last night, it took him several minutes to remember the name of the it! Whether it was several regional associations or an association of top-quality wineries from across the state, I believe a label can market a philosophy and guarantee of quality successfully. An AOC-type system might do more to raise quality across the board than what some might write off as "elite" wineries that they do not want to "belong" with. But we currently have nothing to help us tell the story of the most quality conscious wineries or to differentiates them from the hundreds who have a different agenda or business model and I for one, would appreciate such a tool. Yes, we are doing well across the board and are very bullish on the category. We may not currently have a big portfolio but feel it is a very strong one especially with the addition of LiV. Living out there you probably know the vodka but I find the whole idea of potatoes from LI making a local vodka really interesting. I'm also a big fan of the whiskies of Finger Lakes distilling. Glad to have your input and it is even better to know that you are familiar with the business on a bunch of different levels. Interesting that this is such a small industry. In our little village of Trumansburg there are 2 of us in the business (he works for Skurnick) and we are always looking for the opportunity, excuse really, to drink each others producers and compare notes on the business. Rick: I'm not a big vodka drinker, but the LiV stuff is very well done. Purists who prefer vodka without flavor probably aren't big into it, but the subtle flavors and smooth finish are delicious. Finger Lakes Distilling is making some great stuff -- their Seneca Drums Gin is a favorite. Evan - What New York Needs Now is in the title so my speaking for the region comment was legit. Mark covered a lot of my sentiments as we have had many conversations regarding this area of interest. That's also why we went from 0-60 in such a short time. There is some passion here. As far as the AOC talk goes all you have to say is La Tache, Napa Cab, Marlborough Sauvignon Blanc, Willamette Pinot Noir and many many others. Labels help create an easy framework of reference for consumers to learn quality. Remember a consumers position is one of insecurity for the most part. Intimidation is always present in your average customer. AOC, DO's, AVA's all play a part in honing in your analytic skills. California, French, Italian or Finger Lakes don't really offer specifics when you consider the wide variety of differences exist within the diversity of the region. As far as diversity I think diversity is good but reality is that no region on earth sustains the amount of varietals the the FLX scene is currently commenting on. California does it all but the climate variation is hugely more diverse than NY's. Sure diversity in NY can and will exist from FLX to Hudson to LI but focus in the end needs to trump. And just for philosophy's sake, nobility must be kept in touch. Nobility drives motivation which drives action (as does money) but nobility doesn't corrupt as money and distribution do. The reason we know La TAche is becasue of DRC or the reason we know Napa is because of Montalena or Stag's Leap. Pioneers are noble and pioneers are idealistic. One more.......I think it is important to call out the leaders of the region because in the end it is their show. And enough of the too busy or too this that to get it going. In my idealist opinion the names mentioned before are obligated to propelling the region and perpetuating leadership qualities. Us....the advocates....merely nudge, opine and infuse passion and enthusiasm into the system. I grew up eating concord and sledding down the hill that Heart and Hands now sets on. I've been in the wine biz for 8 years. I managed a retail store in Brooklyn Heights, managed an Australian Portfolio for a distrubutor and now sell wine in the great state of Connecticut for the same distibutor. I have gone back and forth with producers/winemakers on the debate of a consumer-friendly way of determining quality in the Finger Lakes. For an outsider looking in, it might seem quite simple. I've had many feelings similar to many of the topics discussed above. However, there are a number questions that need to be answered in forming a quality standard in the Finger Lakes. 1. Do you focus on a producer, plot of land, a varietal, a vintage? 1. Is it based on their entire portfolio? 3. Do they have to grow the grapes (estate only)? 1. Is it all the grapes that come off that land? 2. Is it what a particular producer does with the grapes from that land? 3. What if a winery makes a flawed wine with grapes off that parcel? 1. What variety is acceptable for admission? 2. What styles are allowed? For example, if it was Riesling for the Finger Lakes, would you allow for a sweeter style Riesling in addition to drier styles? 3. What if you wanted to introduce another variety like Cabernet Franc or Pinot Noir or sparkling into the classification? 2. Who determines who is "in" or "out"? Styles can vary from producer to producer (like a "dirty" vs. "clean" style of wine) and quality wine means different things to different people. 3. Is the system QPR based? 4. What would be the indicator of quality? A symbol on the label? A custom bottle (possibly embossed logo)? 5. Are the wines that are being evaluated already bottled? If so, #4 would be difficult to re-bottle in new glass. If it is in tank/barrel, there is potential for quality differences in the final product. 6. Is it one wine from one producer that wins for that year? If not, is there a maximum number of entrants? 7. Are their size limitations on the # of cases the producer make of this wine/total production? 8. What is the process of removing a producer/wine from the classification? 9. Are the wines judges blindly? If so, would it be acceptable for a wine named "Cow Pee Riesling" to be within this classification system if it met all the criteria? Evan was correct in his assessment of our time. It is nearly impossible to reach many of the winemaker/owners throughout the day to discuss business, let alone forming quality standards for the region. Some of us work all 7 days out of the week. I can't be certain that the amount of time creating/developing/running a quality standardization would be the best use of my time in order to keep my business running. Not to mention the amount of money in marketing efforts to push forth the message of quality. I'd be happy to hear how I'd sell more wine with this system, but it might take decades to educate the consumer and sell that extra bottle of wine. I personally don't agree that classifications in France translate directly to quality in the bottle. For many avid wine drinkers, I'm certain that others have experienced some fantastic wines from lower classified (or non-classified) producers. Wine shops like Red Feet Wine Market seem to pride themselves in finding obscure, "undiscovered" high quality producers from around the globe. One thing I can assure you that you are NOT going to hear in a wine shop like Red Feet is, "this 3rd Growth is better than this Chilean red blend because it's classified". I'd love to hear feedback on these questions. Peter - I'm sorry we converted your sledding hill into our vineyard. We hope you enjoy the wines off the land in years to come as much as you enjoyed sledding. Evan and I have talked about it quite a bit, but ultimately I keep coming back to "Who cares what we say?" We've obviously built a site that many consider a quality one -- even and important one -- but I'm not sure that we are quite "there yet" in terms of reputation and perceived expertise. So for now, the 'growths' Evan and I have shared in email will remain private. We too would need to answer all of your questions above before diving into it, and I honestly don't have firm answers on all of them yet. That's why this type of discussion/forum is important. Great comments, and I understand your desire to see the best producers take over this effort. Lenn is probably right to say we can help nudge the conversation forward, but we'd be quickly accused of arrogance if we thought we lead it on our own. I had dinner with one of the best winemakers in the Finger Lakes last night, and he said there have been talks about AOC dating back most of the last decade, but he was frustrated by the politics that seem to inevitably dominate. Tom Higgins asks the right questions. I'll just say: No system will please everyone. Some might sit out, or take their ball and go home. Seeking a perfect system is the best way to make sure we never get anything done. Forgive this late reply, but it is not for lack of trying. I tried to send you a response from my phone when I was waiting to board a plane at JFK but for some reason it would not upload. In short you are welcome to contact me at charles@paumanok.com. We think too much alike. It seems many of the arguments for AOC may be summed up as "it is a useful tool to promote the wines and the region". Therefore I reiterate the point and the question: If in fact a better promotion and better visibility is sought then why not address that as a broader question? Perhaps AOC will turn out to be an answer, but I think not, unless there is a different definition of AOC that I do not know about. From what I know, whether it is AOC in France, DOC in Italy or DOG in Spain they tend to have developed over time into a protective system. They have codified what had emerged over the centuries as to what they can plant, and what practices need to be observed etc.. You may only plant Chardonnay and Pinot Noir in Burgundy, for example. In Italy some of their best wines, the Super Tuscans, are outside of the DOC because they include typically Bordeaux varieties that are not allowed in the Tuscan DOC. Many European Vintners complain loudly about theoir AOC/DOC/DOG as they see it as an obstacle. In that light I am not sure what an AOC does to answer many of the requirements that have been brought forward in various posts here. So perhaps someone wants to take a crack at defining what AOC is contemplated and why would it be anymore useful that a reformed NYWGF that finally will do the job that it should do? One more thing: if the NY wine industry has not been able yet to get together to speak with one voice on simple matters, something as complex as an AOC, can turn out to be an unsurmountable challenge. It would be better to start with something less ambitious and directed at promotion. As a retailer, I'd like to address your point about stocking "fine" local wines with 'sweet pink" local wines. I've found that many of my customers are very loyal to specific wineries. It would not be uncommon to find a Niagara and a Pinot Noir from the same winery in a persons cart. It works well for the consumer and they are my ultimate "boss". We also have an Italian section, German, S. America etc. We do stock select local wines with fine domestic wines of the same variety but they sell best from our exclusive NY section.